The UltiMate 3000 Quaternary Analytical Low-Pressure Gradient Pump LPG-3400A is the pump of choice for flexibility across a broad range of analytical LC applications, with the highest degree of choice in eluent proportioning and mixing. Up to four solvents may be used for convenient method development, system flushing, and eluent preparation. 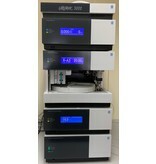 The LPG-3400A is ideally-suited for method development, as well as for analytical research and routine analysis in the pharmaceutical, food and beverage, and environmental industries.